Welcome to the New Release post showcasing projects from Our Daily Bread Designs November Release, you can see all of the November Releases here. Continue reading below to find out how you can win a $50 Gift Certificate to the ODBD Store good towards the purchase of ODBD stamps. I created two projects to share with you today using Our Daily Bread Designs new Vintage Pattern Ornaments stamp set, ODBD Custom Circle Ornaments Die and the beautiful papers from Our Daily Bread Designs Christmas Paper Collection 2013. The first card is a Double Gate Fold Card, the card base is cut from Espresso card stock. I layered each panel with Vanilla card stock and a portion of the Christmas Paper Collection. I stamped the sentiment from Christmas Door in Chocolate on the center panel. 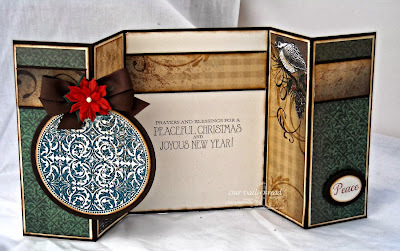 To embellish the left gate fold, I embossed the Vintage Pattern Ornament in Verdigris on Vanilla card stock, then die cut the image using the ODBD Custom Circle Ornaments Die. I sponged the edges in Gathered Twigs Distress Ink and layered onto a Spellbinders Circle that was die cut from Espresso card stock. I added a Vintage Brown Seam Binding Bow and Prima Poinsettia to the top of the embossed ornament. 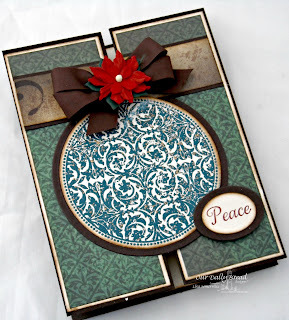 On the right gate fold, I stamped the word “peace” from the Perfect Gift stamp set in Cherry Cobbler on Vanilla, and die cut with Spellbinders Oval Die, layering on an Espresso Oval. This next card features the other Vintage Ornament pattern in the stamp set. All pattern paper is from the ODBD Christmas Paper Collection 2013, layered on Espresso card stock, then to a Kraft base card. 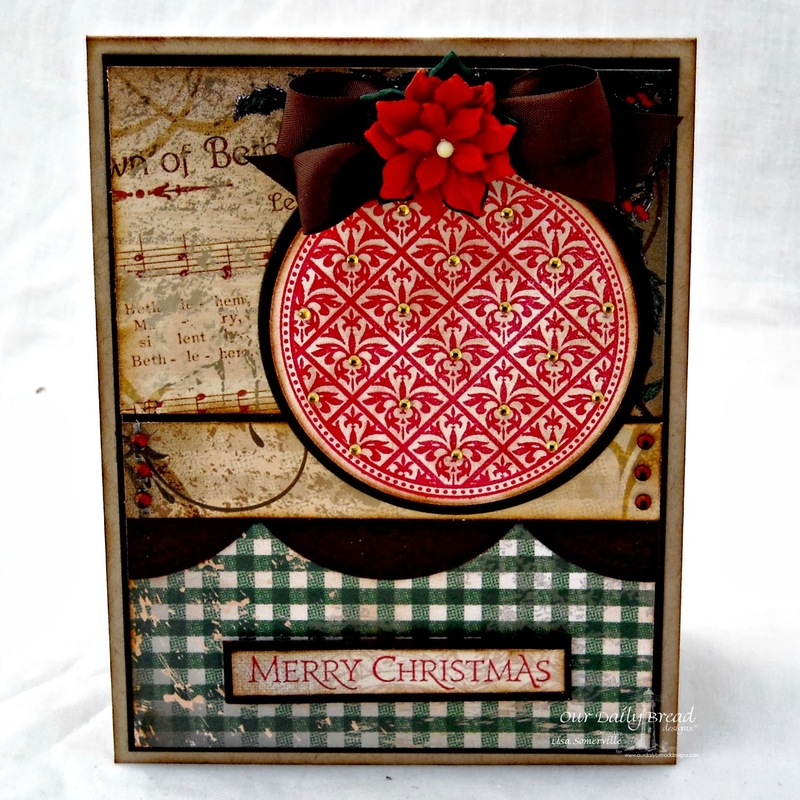 The ornament is stamped in Cherry Cobbler on Vanilla card stock, then die cut using Our Daily Bread Designs Custom Circle Ornaments Die and layered onto an Espresso panel that was die cut with Spellbinders Circle Dies. To embellish, I added a Vintage Seam Binding Bow, Prima Poinsettia and Zva Creative Crystal Gems to the ornament. The sentiment is from Our Daily Bread Designs Christmas Pattern Ornaments, stamped in Cherry Cobbler on a scrap of the Christmas Paper Collection, layered on Espresso card stock, then attached to the base card using dimensionals. Kelley will randomly be selecting 1 winner who will receive a $50 gift certificate to Our Daily Bread Designs, good towards the purchase of ODBD stamps, just for commenting on the Design Team cards! You have until Saturday, November 2, 2013 at 9:00 p.m. EDT to leave your comments. The Winner will be posted November 3rd, on the Our Daily Bread Designs Blog, so be sure to check back there to see if you are won! Awesome projects, Lis!!! Fabulous way to feature the new papers and stamps! HUGS!!!! Both cards are so gorgeous!! Absolutely gorgeous and awesome use of the new papers!!! Wonderful ornament cards. Love the fold on the first one. These are beautiful Lisa. The gatefold is a beautiful way to use those gorgeous papers. I love the warm homespun look of both cards. Oh my are these both wonderful, such Beautiful design and use of the papers on the first and love the country feel to the second and like how you topped it off with the flower! Such beautiful cards. Love the poinsettias and the gingham. Beautiful!! love them both!! lovin the new stamp sets!! Really pretty colors and papers. And really like the double gate fold. Love the cards, makes me think of a log cabin and a cozy fire going in the fireplace...love it. I love your card designs especially the Double Gate Fold Card. I am looking forward to trying out your technique....with ODBD stamps and die cuts. I appreciate your hard work in making the gate fold card. It's gorgeous. The second is equally gorgeous. Beautiful projects, love the gate fold. The music sheet and layout on card 2 are really nice. Great release! Oh my goodness Lisa - your cards are beautiful! I love the papers too!! Your Double-Gate card is pure brilliance - I can barely take my eyes off of it to look at your second and it's gorgeous as well. Hugs! These are beautiful, I'm loving these papers! The chickadee peeking out from the inside of the gate fold card is so adorable! Beautiful creations both!! Especially LOVE the double gate fold card...outstanding! Wow Lisa!! Gorgeous creations!! I just love your use of the dp but your gatefold is stunning!! Love it!! Love the rich colors here Lisa!! What a stunning Double-Gate fold card! The papers really enhance the ornament image!! And the second with the red and gold rhinestones is so striking! Very nice cards, lovely use of the papers! I really like that vintage pattern. These are awesome. You have made wonderful choices in the papers, images and layout of the cards. You have also inspired me. I simply must make a double gate fold card now. Won't be as beautiful as yours, but it will be fun to try. Thanks so much. Both of your cards are so gorgeous, Lisa, and show off the papers beautifully! I especially LOVE the Double Gate fold card! Hugs! Beautiful, Lisa! Wonderful use of the gate fold and the gorgeous Christmas papers. I like your style in the way you created these beautiful cards. I like the gatefold card with the fancy circle ornament. Gorgeous. That double gatefold card is the cat's meow! How awesome is that! I love it and the vintage look of your second card. Awesome projects! Beautifully done!! I love the fold of the card and how it shows off the image so well. Such rich looking cards! I really love the gate fold of the first one and I'm loving these new stamps! Beautiful, Lisa. Love the new papers and the rich colors u used on the cards. Love both cards! The gate fold is a stunner! Beautiful textures too! Ooooo . . . I don't think I have ever seen a double gate fold card before! It is really cool looking. And of course, yours is gorgeous, love the way you decorated it, both inside and out. Lisa, both cards are beautiful! The fold card is so, so cool!!! Lis, love the Double Gate Fold Card!! Very cool and I love how you designed them both using the ODBD papers!! Awesome ornament cards!!! These are so lovely! The double gate fold card is spectacular! Love the double gate fold and the papers... YUMMY! Great way to show the stamps and papers off Lisa! Oh Lisa, these are both gorgeous!!! I LOVE the double gate fold! It shows the papers beautifully and the ornament is the perfect front panel! Beautiful design, as is the second one as well! You really spotlighted the papers beautifully!